EBay is shifting its payment operations from PayPal, pushing apart two companies whose fortunes have been intertwined since the dot-com boom in the 1990s. The breakup highlights the rise of a new generation of financial technology companies. EBay said it will eventually replace PayPal with a Dutch firm called Adyen as its primary payment processor, more closely integrating payments on its site. The online marketplace expects to have mostly completed the move by 2021, and PayPal will still be offered as a way to pay at checkout until July 2023. The auction site said “PayPal will remain an important partner to eBay,” which is the equivalent of “let’s be friends” in the corporate world (Adyen is about half PayPal’s age). These days, shoppers expect to be able to both shop and checkout on the site where they transact, eBay said in a statement. As eBay intermediates these payments, customers will be able to complete their purchases on the online marketplace. 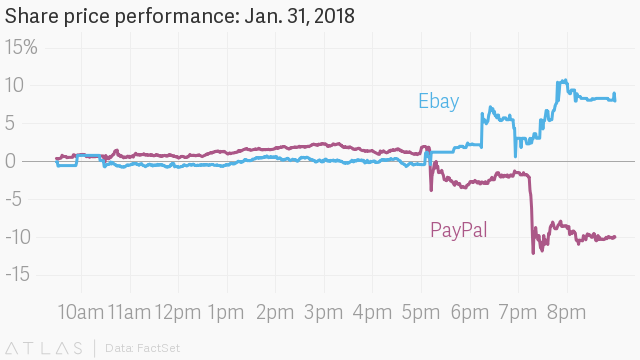 Shares of PayPal, which has been closely linked with eBay for more than 15 years, fell sharply in after-hours trading following the announcement. EBay’s shares jumped, as investors anticipated that it will boost the amount it makes from fees as it pledges to “intermediate” payments on its platform. PayPal has benefitted as digital payments proliferate around the world. Even so, it faces intense competition from industry giants ranging from JPMorgan to Apple, a consortium of major US banks called Zelle, as well as newer players like Adyen and Stripe. PayPal’s relationship with eBay has sometimes been fraught, but it owes much of its early success to the digital marketplace. It focused on online auctions at the turn of the century to grow while fending off eBay’s own payment initiatives, according to a telling of the events (The PayPal Wars) by Eric M. Jackson, an early PayPal marketing executive. EBay ended up acquiring PayPal in 2002 and then spinning it out in 2015. PayPal’s market cap of around $100 billion is now roughly double that of its old parent. Adyen, meanwhile, launched in 2006 and has since won over companies like Spotify, Netflix, and Transferwise, according to the company’s website. It processed $90 billion in transactions in 2016. PayPal, which says it has 227 million active customer accounts, handled $131 billion in total payment volume in the fourth quarter alone—eBay represented about 13% of that volume. EBay says the switch to Adyen will cut costs for its sellers and will allow it to offer more payment options in more countries. The company says it’s “making significant investments” so that it can integrate payments into its processes, building up a team of several hundred specialists as a result. As the use of cash slowly fades, the opportunity for everyone from eBay to Paypal to Facebook and Apple is immense: Cash is still used for about 85% of global transactions, according to some estimates. The scramble to control payments, and the wealth of data that come along with them, has now attracted many of the world’s largest and most innovative companies. Who will prevail in this volume-driven business is unclear, but as the competition drives down costs it looks like consumers will be the primary winners.